Living in Southern Louisiana, we are surrounded by water. 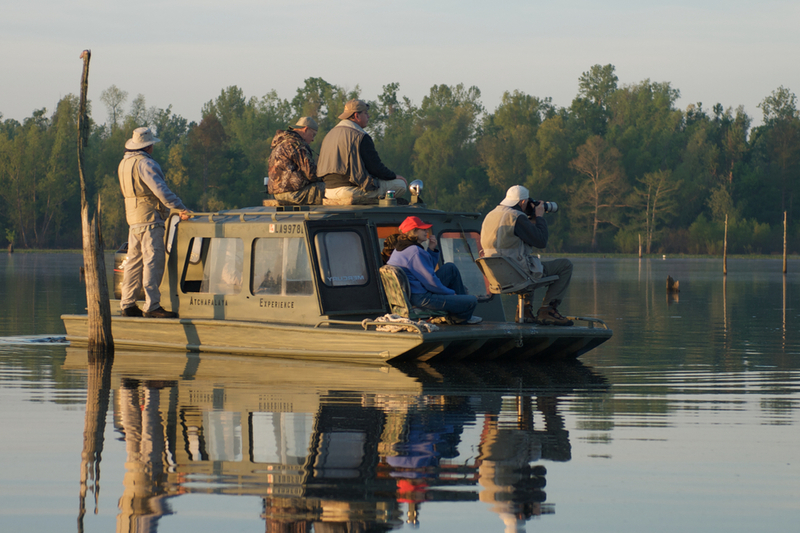 Over 40 percent of the wetlands in the lower 48 states are within Louisiana. The crown jewel of Louisiana Wetlands is the Atchafalaya Basin. The Atchafalaya Basin is North America's largest swamp and has an abundance of wildlife. With all this water, a nature photographer in Southern Louisiana will at some point spend time photographing from a boat. On my photo tours, we spend a lot of time on boats and to get the most out my tours it is important to know how to shoot from boats. Besides the fact that many of the best photo locations are only accessible by boat, when photographing wildlife, it is often possible to get much closer in a boat without invoking the fright or flight response. In a boat we are typically much lower and don't look as large or frightening as when standing. We also frequently camouflage the boats to further disguise the human form. However there disadvantages as well. The largest disadvantage is the lack of a stable platform. Motion caused by wave action makes making sharp images challenging. Closely related to this is the fact that due to rocking motion of a boat it is often difficult to maintain a straight horizon. Another disadvantage is space limitations. Many of the locations we photograph in are only accessible by skiffs powered by outboards or betting yet air cooled "mud boat" motors. The Gatortail "mud boats" used by the folks at Atchafalaya Experience, can only comfortably accomodate three photographers with limited space for camera equipment. Finally one must not overlook the risk of getting your equipment wet, either from rain you can not escape, or water splashing into the boat. Use your body like a tripod. Cradle the lens under your left hand, grip it with your right. Keep your arms to your side and if possible rest your elbows on your knees. Carefully squeeze the shutter button, think about walking on egg shells when you do it. Minimize any potential movement in the process of firing the camera. Maximize your shutter speed. Think about the least amount of depth of field you can get away with and set your aperture to as wide a setting as possible. Increase your iso sensitivity to the practical limit on your camera. Newer cameras give great results even at iso 1600, this is a time to use the higher sensitivity and use noise reduction in post processing to deal with the higher noise. Use Image Stabilized lenses at slower shutter speeds. However at shutter speeds above about 1/500th it usually won't be of much help. If all else fails, think of creating intentionally motion blurred shots. When shooting from a boat I like to travel light. Usually I have two bodies, a wide angle lens, a med-range zoom, and a moderate telephoto. Using a long telephoto on a boat is usually unnecessary and very difficult to do. Since you can usually get much closer than shooting on land, it is very seldom you would need one anyway. Dealing with a lot of equipment on a boat simply leads to a high degree of frustration and a lot of missed opportunities. Keeping organized on the boat and getting to what you need quickly makes the difference in getting the shot. This is another reason not to use a tripod. Setting up a tripod takes a lot of space and if there are other photographers on the boat it limits what you can shoot, because they're always in the way and usually you're in their way as well. If you must use a camera support, consider using a monopod instead of a tripod. While you still will be dealing with vibration and movement issues, at least you'll take a smaller footprint wish will be easier for you and the other photographers to deal with. A small waterproof case is a very good idea. Last year I had a couple of cases where water washed over the boat and got onto my equipment, no damage, but a good warning. Carry a couple of very good pancho's. On our tours, the folks at Atchafalaya Experience are equipped with large military pancho's, on several trips we got caught in serious rain and the panchos kept us and our equipment dry. Head for shore at any hint at a thunderstorm. A small boat on the water is quite a target for lightning. Don't chance it. Carry a few black trash bags. I've often shot in the rain with a trash bag keeping the equipment dry. Remember when you're on the water it feels a lot colder, high humidity and wind from the moving boat equals a low wind chill temperature. Even in the fifties dress in layers with a good Gortex shell as the outer garment. For my December tours, thermal underwear is essential on the boats. They have the right boats for the job. They have many boats and depending upon the shoot one may have an advantage over another. If we need to get in tight places they have the gator tails that will go almost anywhere, if it's going to be cold or may rain, they have a cabin boat (very good if you need to shoot high by the way). If we need a bit more stability or have a few more people, they have crawfish skiffs. They know the area, they're out there all the time and know the subjects and where to find them. Many of the places we go to are well off the beaten path, knowing the area is essential, you really don't want to get lost. They've worked with me long enough to know where I want the boat in relationship to the light and wind. It's to the point we don't even need to communicate that, they just know where we need to be. They know how to get the boat as stable as possible. If you're planning to shoot from a boat spend the time to search out the best service you can, it can make all the difference. I don't own a boat and really don't want to, there's a lot to it and I have enough to do with the photography. Don't use a tripod unless absolutely necessary. If you must use a camera support consider a monopod. Use good telephoto lens techniques and high shutter speeds. Use Image Stabilized or Vibration Reduction equipment if you have it. Prepare for adverse weather, waterproof case, panchos, and plastic trash bags. Use a professional service that knows where you're shooting and how to work with photographers. Don't take a chance with lightning, at any hint of a thunderstorm, go back to the dock as soon as possible. Pack light, take only what you know you will use, not everything you have. Leave your long lens behind, it will just get in the way and you rarely will need it. I've only used my 600 mm lens twice on the boats and was very disappointed with the results. Trying to aim a 600 mm lens with everything moving is an exercise in futility. Remember it feels colder over the water, even with temperatures in the fifties, dress in layers and plan for temperatures at least 10 degrees cooler than air temperature.